My ambition is to offer engines and components that convince in terms of quality, performance and price. The offered products for the engines are carefully selected. hundredfold and are produced exclusively in series. as well as the spare parts supply, is guaranteed. just contact me: by phone or e-mail. Behind it´s me, Ben Nowak, mechanical engineer and Vespa maniac. In the years 2007 - 2012 I was owner of PEP-PARTS. 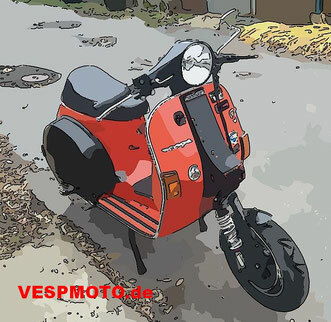 Specialized in the construction and sale of engines and tuning parts for Vespa scooters. In addition to complete engines, parts were also developed. Exhaust systems like PEP 1 - PEP Plus and 61 mm stroke crankshafts. Since it´s founding, the passion for engine construction and development is still alive. the quality of the products have evolved. Until now, I built more than 200 PX engines! This results in a huge motor tuning experience. Mostly reed valve engines but also rotary valve engines. Australia, Norway, England, France, Germany, Austria, Italy, Switzerland, Hungary to New Zealand, Martinique and Puerto Rico enjoy the quality and performance of my engines. and the battle for the last horsepower has not ended. I only offer you new parts of the leading manufacturers, in the best quality! My range of products is limited, which is reasonable to it´s quality and performance.